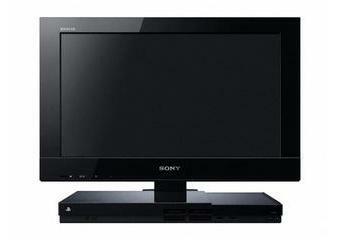 Your PlayStation 3 might not be compatible with PlayStation 2 games, but a new television is. In an awesome, but somewhat confusing move, Sony is adding the ability to play PlayStation 2 games into a new line of products. It may have taken PlayStation 2 backwards compatibility out of the PlayStation 3 years ago, but the format survives through Sony's Bravia KDL-22PX300 television set. PS2 backwards compatibility in a PS3 console only exists today in three discontinued models: the 60GB, 20GB, and original 80GB (with 4 USB ports). As an owner of one of those, I can't tell you how handy it is to own a single system that can play the entire PlayStation library as we know it, from PS1 to the present. Sony is sort of allowing that level of compatibility once again here, if you own the 22-inch LCD KDL-22PX300 television and a PlayStation 3. The television set sits on a base that is partially a PlayStation 2, and comes with one DualShock 2 controller. One side of the base is held closed with a latch, which when opened reveals the drive where a PlayStation 2 game can be placed, in addition to a DVD or CD for that matter. Memory cards slots and controller ports are located in the front of the base. The KDL-22PX300 is one of the only videogame-integrated televisions to ever hit the market, and is only available in Europe for Â£200 ($314) at this current time, with no spoken of plans to bring it to other regions. It has plenty of HDMI ports and the rest of the features you'd expect in a new television, and is sort of like the new, flatscreen wave of those televisions that used to come with a VCR or DVD player built in. I like the idea, but it also seems confusing to include support for a gaming console that is basically dead outside of the used market right now. Still, it's better than just having a DVD player as the base of your TV, even if PlayStation 3 owners are getting slightly miffed right now.